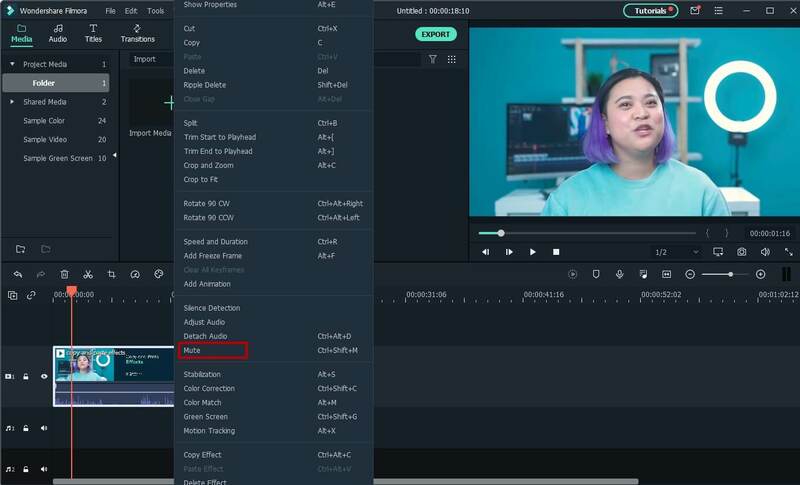 Edit, mute, detach, mix the audio easily with Filmora. Video editing can be a fun task, but it can also be frustrating and challenging. Adding finishing touches to make it appear better will surely require knowledge and expertise. More than just adding special effects, another thing that you might want to do is to mute video in specific parts, such as when there is crappy noise. There are many instances wherein you will find it practical to mute some parts of the video that you are editing. One of the reasons to mute it is when there is crappy noise in the background. The sound of a barking dog, loud footsteps, or rain, among others, can affect the quality of your video. Any distracting or broken sound in the background should be removed so as not to negatively affect the overall quality of the video. For instance, if the video is an interview of someone and bad words or potentially offensive statements have been uttered, you might also find it practical to mute video. If you plan to embed a background music, muting the audio will also be beneficial. Generally speaking, there are two ways by which the software can be used. Methode 1:The first one is through using the “Mute” feature. The first thing that you have to do is import the file on your computer. Open the video editor. Drag the file to the timeline of the software’s interface. You can also click on the “Import” button. Right click on the file and select mute. After doing this, save the file based on the format that is preferred. Methode 2:Alternatively, you can also use the audio detach feature to mute video. To do this, open the program. Click on the “Import” button and select the video that you would like to edit from the hard drive. Once it is loaded, it will appear in the file tray. If you double click on the video, a preview will appear on the right screen. Right click on the file and select “Audio Detach”. Once it is separated, it will appear in the audio timeline. Simply hit the delete button from your keyboard and the audio will already be removed. You can also edit this separated audio to better match your video. With WondershareFilmora, you can mute video with ease. You do not need to be an expert in using software programs. Even if you are a beginner, just follow the easy steps we have mentioned below. It will only take a few minutes of your time before you can take out unwanted audio from your file. If you are looking for a software that can be used to mute video, you can be possibly confronted with overwhelming options, each with the promise of being the best. In this case, there is no need to look any further.Wondershare Filmora can prove to be one of the best choices. It is a video editing software that will allow you to handle any editing project with ease. It is one of the most trusted options available in the market today. There are many reasons why Wondershare Filmora is an excellent choice to mute video. Among others, its popularity can be attributed to being user-friendly. It’s easy-to-use interface will surely be loved even by beginners. Even if you have not edited videos before or if you are totally clueless about how it works, it will not take long before you can be using it like a pro. Aside from being user-friendly, it is also an excellent choice because it can support different file formats, such as MP4, MOV, MKV, and AVI, among others. There is no need to convert the file before having it edited as it can be supported by the software. It will also allow you to save the video and make it playable on different devices. You can also add watermark and special effects. Lastly, it supports both Windows and Mac OS X.